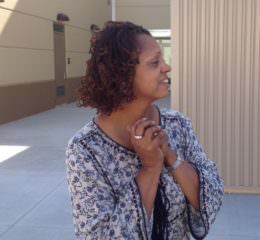 Yvonne Dunigan stands outside the school she worked at since the beginning. Yvonne Dunigan walked the halls of the new $19.6 million school on South Crenshaw Boulevard and remembered when on that same street corner there was a Ford dealership where she bought her car 13 years ago. She’s still driving that same car, but much else about the landscape has changed. “I knew someday that this would happen and this school would be built, but it’s hard to believe it’s here,” said Dunigan. For 17 years, Dunigan has worked as the school operations manager for View Park Elementary School, which until the advent of the new building had to be divided up into three different locations, including at Crenshaw High School. She remembers protesting at the L.A. Unified school district with fellow parents to open the charter school, and then sending her son and daughter there. Working at View Park from the very beginning, she has seen children, now grown, bringing their own sons and daughters to school here. Parker Hudnut where the time capsule will be buried. “And now, we have this building, and everyone is just thrilled, and I’m feeling old,” Dunigan said. View Park is part of the Inner City Educational Foundation Public Schools, which will be dedicating the new building—its first ever built—in the Crenshaw district of South Los Angeles, on Saturday with city officials, school board members and other honored guests. For ICEF—which operates 12 schools in Los Angeles and Inglewood serving about 4,000 African-American and Latino students—it is a crowning achievement for a charter organization that was once on the brink of bankruptcy and facing closure. Dunigan remembers waiting weeks sometimes to get paid and worrying about whether the school she loved would no longer exist. “Miss Dunigan is the heart of this school, she really runs the place,” said Parker Hudnut, ICEF’s CEO. Dunigan, in turn, praises Hudnut’s commitment. “I have to give the credit and honor to Parker Hudnut for making this happen,” she said, standing in the school now known as the ICEF View Park Preparatory Accelerated Charter Elementary School located on the first two floors of the school with Kindergarten through 2nd grade on the first floor and 3rd through 5th on the second floor. The middle school is on the third floor, and a few blocks away is the ICEP View Park Preparatory Accelerated Charter High School. The 43-year-old Hudnut is now figuring out with the students what items and messages they will put in a time capsule that they will bury under the foyer of the front office. It will be opened 35 years from now when the building’s tax exempt state bond that helped finance the nearly $20 million construction project is paid off. “I hope I’m still around to be here when it’s opened,” he said. When Hudnut came to ICEF five years ago, things were dire. Five of their schools were locked out of their sites because rents weren’t paid and they needed new locations before school started in just two months. There was a $7 million payroll, 165 vendors clamoring for payment and only $15,000 in the bank account. With severe cuts, and consolidating some schools, Hudnut got their schools to live within their budgets. He treated them like a business, while always keeping in mind the educational aspect. He came from LA Unified where he worked as the executive director for Innovation and Charter Schools. “We looked at each component of the schools as a business to see what was working, and frankly some of the schools with only 150 students we couldn’t maintain,” Hudnut said. 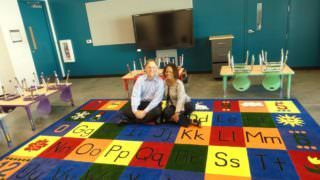 Parker Hudnut and Yvonne Dunigan in a Kindergarten class. Today, Hudnut heads ICEF, which prides itself as a leader in educating African-American and Latino students and preparing them for higher education. The accelerated learning techniques used for the students is based on a school model developed by Henry M. Levins at Stanford University. Their test scores are still not where they want them. The English scores last year in elementary school had 35 percent meeting or exceeding standards, which was better than the LA Unified district score of 33 percent, but less than the state average of 44 percent. In math, the score was 21 percent, less than the district score of 25 percent and the state score of 33 percent. In the middle school grades, the scores are 21 percent in the English tests, while 33 percent at the district level and 44 percent in the state, and only 6 percent meeting or exceeding standards in math scores, while the district is at 25 percent and the state is at 33 percent. The new three-story building on Crenshaw Boulevard stands on a plot of land that long frustrated former Los Angeles City Councilman Bernard Parks. He tried many ways to get something substantial built there. Now, it will have a school that hopes to share its multi-purpose room with the local Neighborhood Council if it wants to hold meetings there, or offer it as a regular place for voting during elections. The school offers a great view of the neighborhood, including downtown Los Angeles and nearby Crenshaw High School, where school board member George McKenna will now have offices in the rooms they previously occupied. The Media Center designed by an interior designer. The school has a computer lab, and nearly a one-to-one ratio of Chromebooks and computers per student. 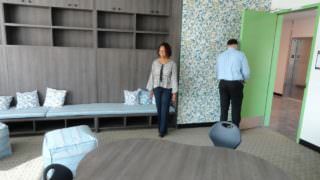 The library holds comfortable lounge furniture and new books from a fundraiser last year and was created for no charge by noted interior designer Bridgid Coulter. Classrooms have interconnected doors so teachers can more easily work together. There is an art room, a science lab and something else they’ve never had before: a teacher’s lounge. The multipurpose room serves as a gym with lines for volleyball and basketball, a stage with an auditorium that can seat 500 and a cafeteria for the K-8th graders. “The students have already taken a lot of pride of ownership,” Dunigan said. Although the racial mix of students hasn’t changed much since Dunigan started working at the school in 1999 (with about 90 percent African-American and the rest a mix of Latino and white), the socio-economic ratio has changed dramatically. The downturn in the economy hurt both the neighborhood and ICEF, so when Hudnut took over, he sought help from the philanthropic community. Former Los Angeles mayor and former California Secretary of Education Richard Riordan joined the board and helped raise money. Then, Hudnut made judicious cuts. ICEF pared down the number of schools and students it once served. Hudnut received help from the non-profit charter group Ex Ed, and the Weingart, Ahmanson, the W. M. Keck and Parsons foundations, among others. Parents donated money, and some even shared their retirement accounts. And just as they thought they were close to being in the clear, they found a stack of unpaid bills, to the tune of $700,000, in the desk of a laid-off employee. 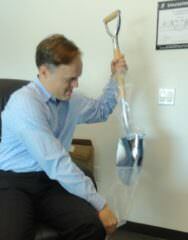 Parker Hudnut with the engraved shovel for the dedication. Hudnut credits the support of Pastor Timm Cyrus of the Angeles Mesa Presbyterian Church where they shared space for the school since the beginning. He will help make the dedication of the new building on Saturday. There is a waiting list to get into the school, that now holds about 1,000. But they hope to grow, and ICEF has plans to start buildings for other schools soon. “This is a true community effort that this school is here, so we hope everyone will come out to see it,” Hudnut said. The public is invited to the open house, which starts at 10 a.m. on Saturday at the school, 5311 South Crenshaw Boulevard. They have an engraved shovel ready for the occasion.